The inspiration behind the radical shape of Lambda originated from a scale model of a Lamborghini Gallardo. Further refinements of this led to the formal idea of two inverted triangles which are slightly offset from one another. This geometric form was then transformed into a house where it has a slight resemblance to the shape of the Greek letter lambda synonymous with the name of the villa. 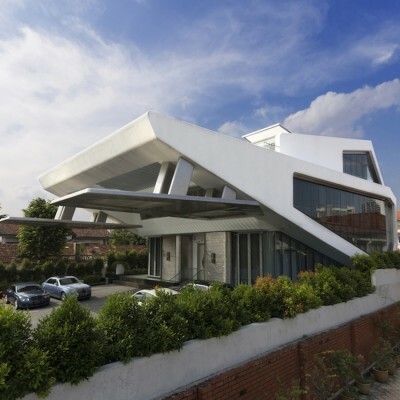 Two inverted triangles slightly offset was used as the house structure. At the rear the point of one triangle was rounded, providing shading to the bedroom underneath. The other triangle was extended, forming a dramatic car porch canopy cantilevering out and supporting two supplementary canopies providing protection for the cars. 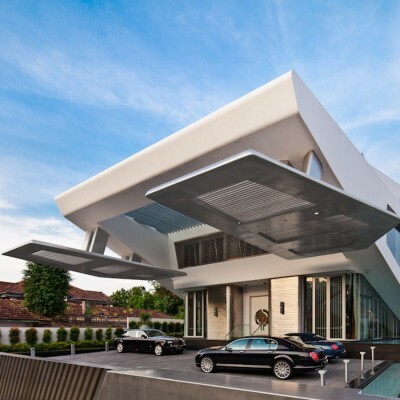 Hence the house resembles a spaceship more than a car. The house consists of a basement, two storeys and an attic.The hub of the house is the dining hall which rises over two storeys. The second storey includes two symmetrical bedrooms of equal size but in different styles. The third storey attic space includes a large study with a customised red-painted table looking out to the terrace. The attic also provides three smaller rooms, including a prayer room. In the basement, apart from services rooms, there is a gym, a sauna and a wooden wine cellar. Villa Lambda is located in Singapore and the design process began in 2011 and construction of the villa was completed in 2013. The house appears to be simultaneously monumental and yet touching the earth lightly with its apparent balancing act and its glazed walls set back inside the white concrete frame. Likewise, it gives the impression of solid materiality while also seeming to dematerialise. 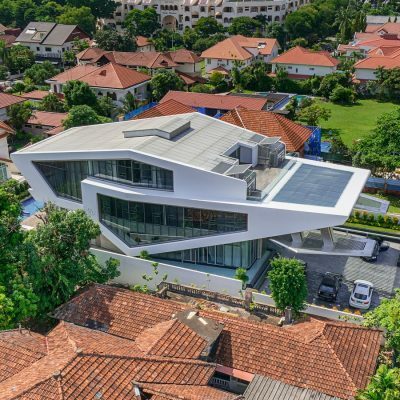 Its sleek modernity derives from its all over pearl white glossy paint finish, solid glazing, low e performance glass, discreetly elegant aluminium louvred front canopies and Alubond roofing, just slightly pitched and in stark contrast to the neighbours. The villa’s built area is 1500 sqm. 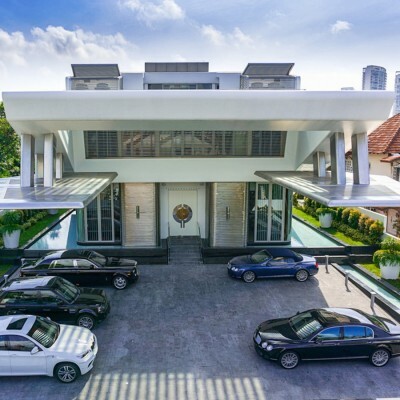 The idea of the villa design came from a model Lamborghini Gallardo car which eventually transformed into geometric form of two inverted triangles to form the house framework. 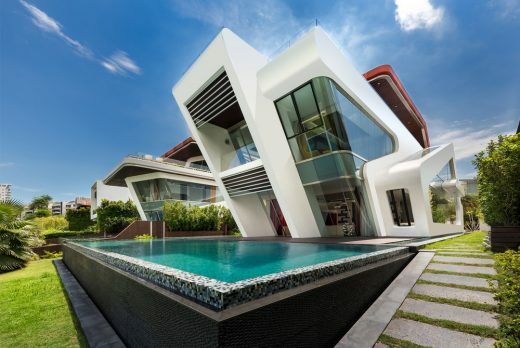 One of the greatest challenge that the design team faced at the early stage was to comply with the regulation for habitable attic spaces in a bungalow, which in Singapore has a rather restrictive code that imposes a pitch roof with very distinctive geometric conditions, yet at the same time find an aesthetic solution that had to visually adhere to the dynamically unique and futuristic style that was set for Lambda since its inception. Also the brief called for an optimisation of a tight site and parking for nine cars. Mercurio Design Lab Srl, 2014. Established in 2008, Mercurio Design Lab Srl (MDL) is an Italian design studio that spun off from one of Italy’s largest and most prestigious architectural firms, AMA Group. With a focus on high-end residential and commercial projects across the Asia Pacific, MDL has become known for its bold iconic design. To date, it has footprints across prestigious addresses in Singapore, Ho Chi Minh City (Vietnam), Jakarta (Indonesia), Haining City (China), Guilin (China) among many others. MDL is a hub for architects, engineers and designers who create and bring into reality structurally meaningful and beautiful works, using creativity and artistic sense as well as always respecting the functional, the aesthetic and the social. MDL has made great strides through the years always striving towards balancing aesthetics and functionality. Our design services range from master-planning and architectural projects to interior design and industrial design. We are also involved in artistic projects and sculpture installations. Under the direction of Managing Director, Massimo Mercurio, MDL has steered towards a more challenging tier of the lifestyle design industry; right alongside the stylish, trend-setting brands that the Italians are so renowned for. As the Asian market flourishes, an insatiable thirst for good design ideas arises. Here at MDL, we recognise the potential of Italian input to satisfy that thirst, and are poised to do just that. In doing so, we serve to fuse two extremely interesting cultures – Italian and Asian – together. On the one hand, there is Italy with its long history, coupled with its evolving modern style. On the other hand, there is the vibrancy of Asia with its own long history on its shoulders. Here at MDL, we hope to bring out the best of the two distinct cultures, creating art that is not only avant-garde, but also enduring. Winner – Lambda Residential Villa by Mercurio Design Lab Srl is Winner in Architecture, Building and Structure Design Category, 2014 – 2015.